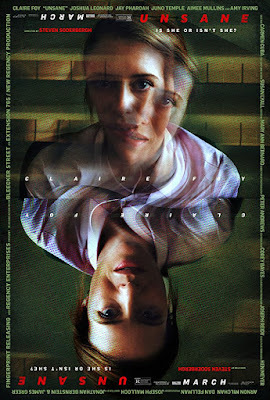 This is a new clip for Unsane. It was written by Jonathan Bernstein and James Greer, directed by Steven Soderbergh, and stars Claire Foy, Joshua Leonard, Jay Pharoah, Juno Temple, Aimee Mullins and Amy Irvinga. The film was reportedly shot using an iPhone and is scheduled to be released in theaters on March 23rd. Check out the synopsis and clip below. "A young woman is involuntarily committed to a mental institution where she is confronted by her greatest fear--but is it real or is it a product of her delusion?"